PRIMACYT HGF Hepatocyte Growth Factor, ready to use. 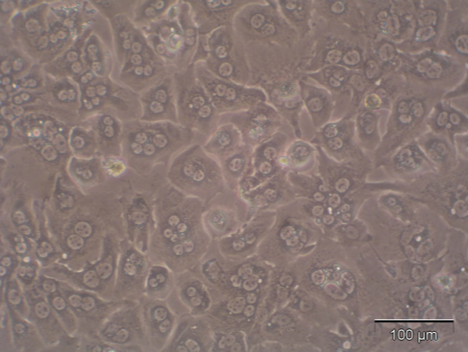 PRIMACYT offers human recombinant hepatocyte growth factor expressed in CHO cells, for in vitro research, including culture media for hepatocytes and animal-component free culture media. PRMACYT HGF hepatocyte Growth Factor is your choice for the in vitro cultivation and maintenance of primary hepatocytes. Our suite of cell culture media supports the creation of your almost perfect hepatic model by stabilizing the expression of metabolism capacity and uptake / efflux transporters. Storage conditions: Store at or below -70℃ upon receiving. Avoid repeated freeze-thaw cycles. default_titleUsage Statement. Products are intended for research use only and must not be used for any other purpose, such as but not limited to unauthorized commercial uses, in vitro diagnostics, ex vivo or in vivo therapeutic uses or any type of consumption or application to humans or animals. 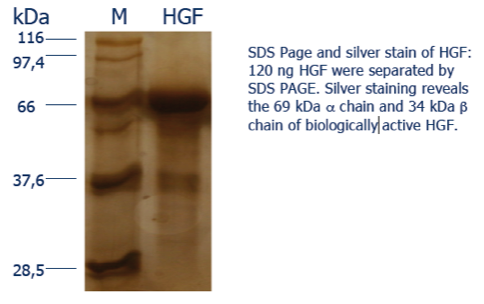 HGF is identical to scatter factor SF, a fibroblast-derived soluble factor that promotes the dissociation of epithelial and vascular endothelial cells colonies in monolayer cultures by stimulating cells migration. Activities of HGF include induction of cell proliferation, motility, morphogenesis, inhibition of cell growth, and enhancement of neuron survival. HGF also plays a significant role as a paracrine or endocrine mediator through an epithelial-mesenchymal interaction in wound-healing, tissue or organ regeneration, morphogenesis and carcinogenesis. HGF is involved in the improvement of neuron survival. HGF is a potent mitogen for mature parenchymal hepatocyte cells and a variety of other cells, including endothelial and epithelial cells, melanocytes, and keratinocytes. HGF is essential for liver regeneration, especially after partial hepatectomy and other liver injuries. It also mediates epithelial morphogenesis. 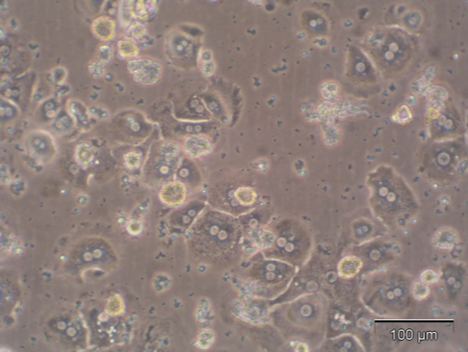 Mouse hepatocytes cultured 3 days in the absence (Control, left panel) or the presence of 20 ng/ml HGF (HGF, right panel). Courtesy of Prof. Dr. Jan Hengstler, Dortmund, Germany. Paracrine FactorThe hepatocyte growth factor HGF is a paracrine factor exerting its actions on a wide array of tissue and cell types. HGF regulates cell growth, cell motility, and morphogenesis. HGF is also known as hepatopoietin A or scatter factor. Secreted by mesenchymal CellsHepatocyte growth factor is secreted by mesenchymal cells. It is secreted as a single inactive polypeptide and is cleaved by urokinase type plasminogen activator (uPA) into a 69-kDa alpha-chain and 34-kDa beta-chain. A disulfide bond between the alpha and beta chain produces the active, heterodimeric molecule.